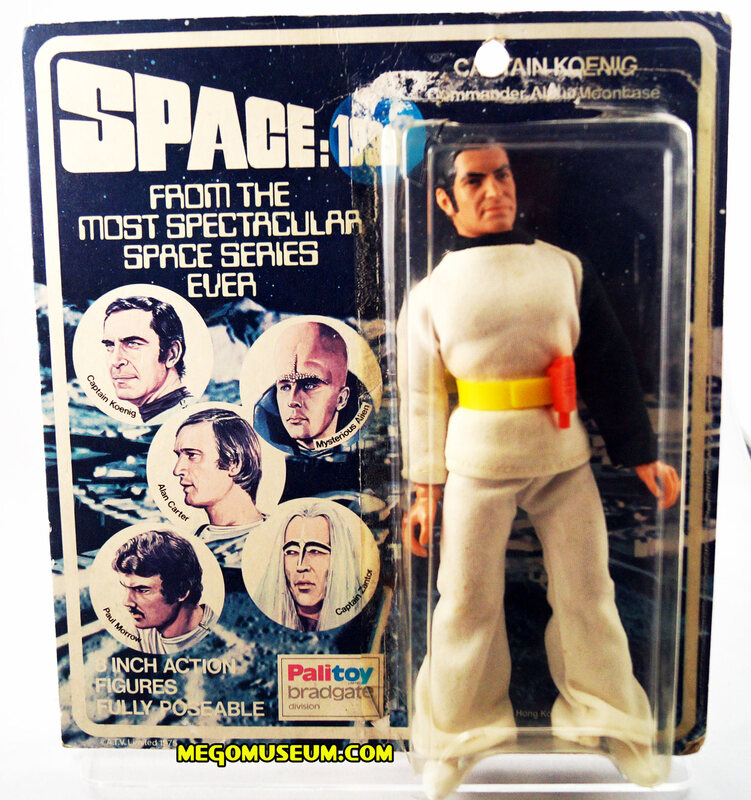 Palitoy Koenig on his card, grey faced variants have actually been found so it suggests the figure saw production past one year. Card photo courtesy of Brian (Palitoy). hero for the “me decade”. 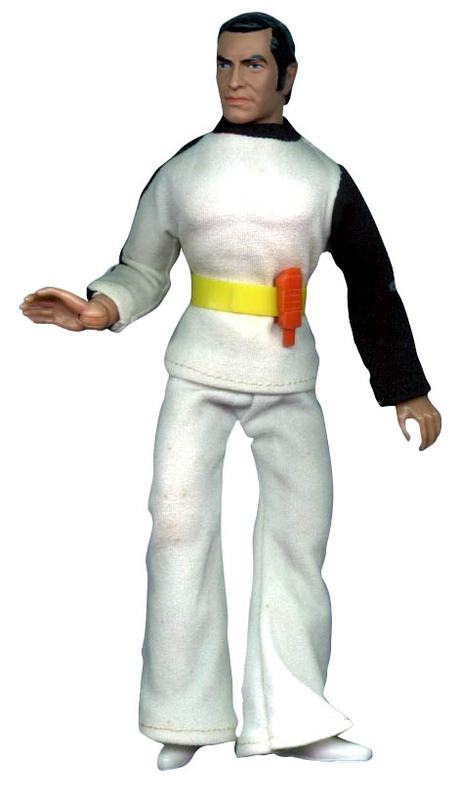 The white bell bottom pants that are unique to the 1999 crew members, has been factory reproduced by Classic TV Toys. The material on the reproductions is a bit more slick. The waist band is folded over the elastic and hemmed, while the originals are not folded over the elastic. The repro’s are a bit shorter and the piping on them has a texture, while the original piping has none. The reproductions are unmarked. 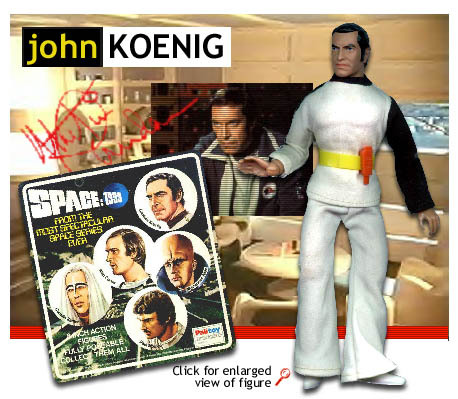 Koenigs shirt “kind of” has been factory reproduced by Classic TV Toys. The material on the reproduction is a bit more slick, is shorter at the waist, and kind of baggy around the chest and armpits. Like the pants, Koenig’s shirt features piping on one side (see above). CTVT neglected to add the black stripe down the right arm of the shirt, and left the black collar off, so the shirt is simply a white shirt with one black arm. It’s pretty easy to spot although it is unmarked. Comlocks have also been reproduced by CTVT and can be difficult to spot until you know the telltale signs. The repro’s are unmarked, and can be difficult to identify. 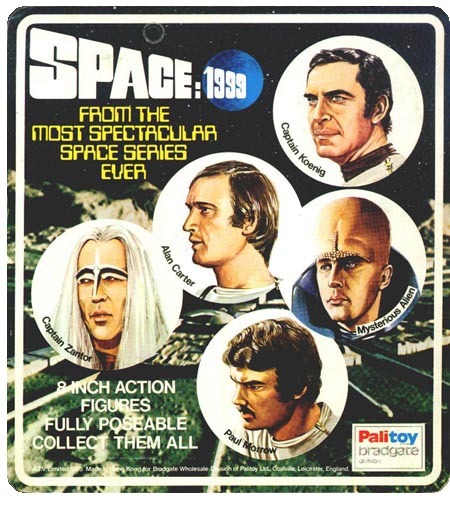 The first thing to look for are comlocks cast opposite an original. Many were cast like a mirror image of an original, with detail and indents on the opposite side. This doesn’t apply to all since many were made orientated properly. Another clue is the button size. The CTVT buttons are larger than the original. There is also a line that goes across the top of an orginal separating the main body of the comlock from the top part. That line is missing on the reproductions. The final clue can be spotted on the clip. The ball shape on the end of the belt clip is much bigger on the reproduction. The 1999 crew belts have been factory reproduced by CTVT and are unmarked. These are almost exact reproductions in all aspects. Very hard to spot. The reproductions tend to be just a little more glossy and a little brighter yellow.